Here are some volleyball drills passing exercises players can do at home or in the gym to start improving ball control. Start by passing the ball back and forth. One person is on the ten foot line and the other three feet inside the end line or back court line. The person closest to the net, on the ten foot line, is the control “target” partner. This is the “target” person who never moves and where the partner who is working needs to get the ball to. If you’re the “working” partner then your job is to get the ball to the head of the “target” without making the target move. 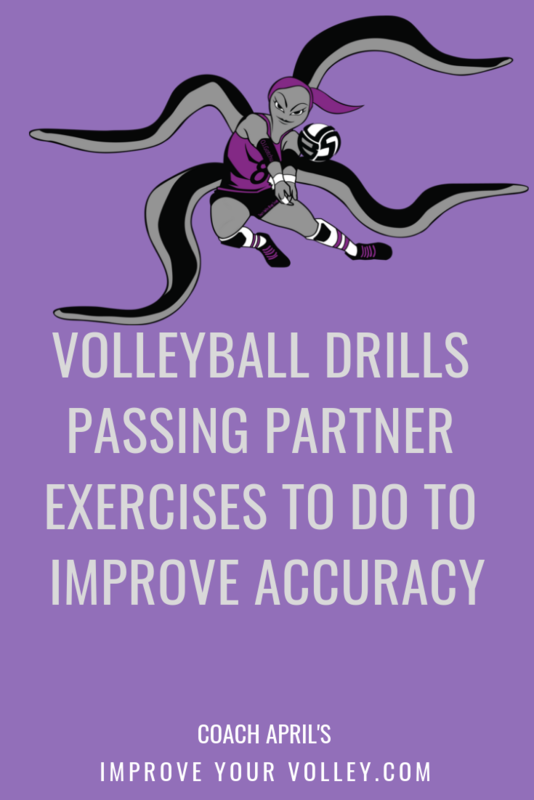 If the “target” partner has to move more than one step to get to the ball that you are passing, setting, or digging to them then you need to improve your ball control. This is a volleyball player’s target practice. Being able to get the ball right to the target you are aiming for…without the target moving… is what you are practicing to do. Get the ball to the target…without the target having to move. To practice moving laterally with quick foot work to your right and to your left the “control” partner passes the ball to the right of the “working partner’ who has to take a shuffle step to the right to pass the ball. The control partner passes a high ball 6 - 8 feet in the air. The “working partner” takes 2-3 steps forward to get feet and hips to the ball and passes the ball to the control partner after which they back pedal 2 -3 big steps backwards to pass a deep ball from the “control partner”. The goal is to pass short and deep balls to the head of the target partner without making them move at all. Do you really want to test your ability to time the ball, use your wide vision to track your movements and your teammates movements, while still controlling the ball and using excellent passing technique? If you're working in a group of four try swapping partners while passing the ball straight ahead. In order for that to work all four participants have to communicate so everyone is on the same page. All four players need to understand who will make the decisions and who will follow directions. All four also need to come to an understanding as to when they will switch partners. This version of the drill helps players practice how to communicate with each other on the court.